Yesterday, a student gave me step-by-step directions to solve a Rubik’s Cube. I finished it, but had no idea what I was doing. At times, I just watched what he did and copied his moves without even looking at the cube in my hands. 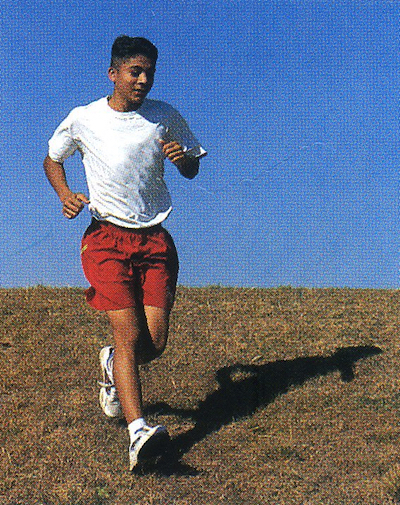 When we were finished, I exclaimed, “I did it!”, received a high-five from the student and some even applauded. For a moment, I felt like I had accomplished something. That feeling didn’t last long. I asked the class how often they experience what I just did. Is there an argument to be made that sometimes the conceptual understanding comes from repeating a procedure, then reflecting on it? Discovering/noticing patterns through repetition? Great question. I wrote a comment in response. If a teacher sees students as disengaged and not liking math, what would be one good thing to watch, one good thing to read, one good thing to try? Watch: Beyond Relevance & Real World. Read: Why Don’t Students Like School? Will you please give me the top three pieces of advice you have for the teachers of our youngest learners? We are K-6 and want to start now. 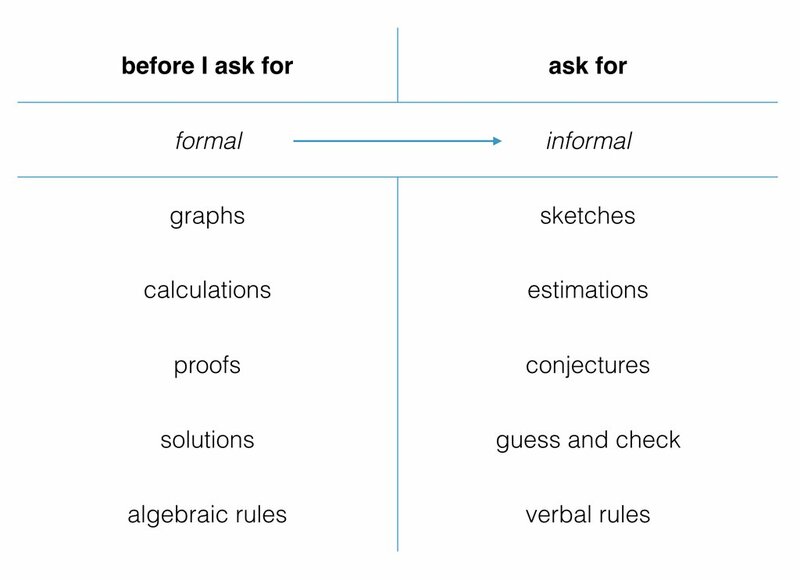 One, ask informal, relational questions (questioning, estimating, arguing, defining, etc.) as often as formal, operational questions (solving, calculating, simplifying). 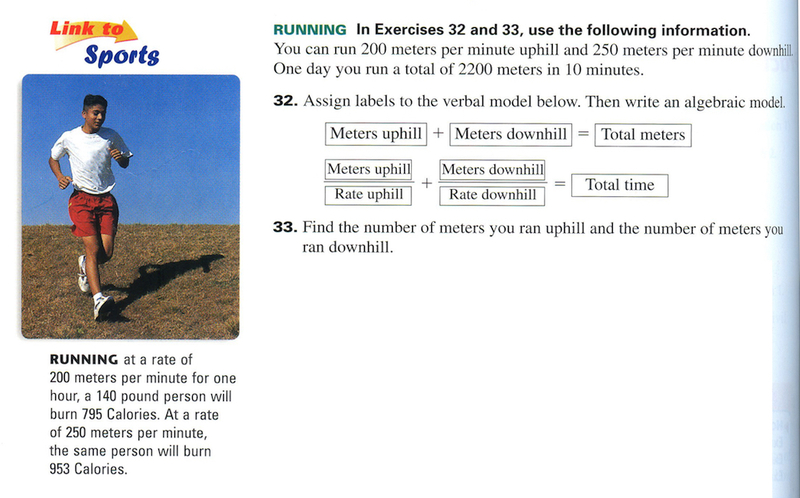 Two, pose problems that have gaps in them – look up headless problems, tailless problems, and numberless problems, for three examples – and ask students to help you fill in those gaps. The most interesting problems are co-developed by teachers and students, not merely assigned in completed form by the teacher. Three, before any explanation, create conditions that prepare students to learn from that explanation. These for example. What are your suggestions for Andrea and Mark? 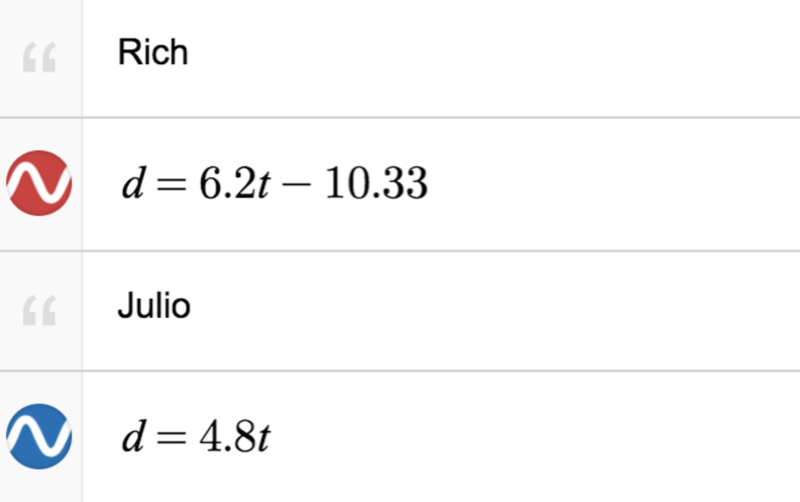 Let’s try to describe a big number using a small amount of syllables (Berry’s Paradox). For example, 777777 takes 20 syllables, but saying “777 times 1001” takes 15. For a number like “741” which is seven syllables, “Nine cubed plus twelve” is much better. More complicated expressions test our perception of order of operations. Have students come up with a scoring system to rank abbreviations. Watch: Five Principles of Extraordinary Math Teaching. 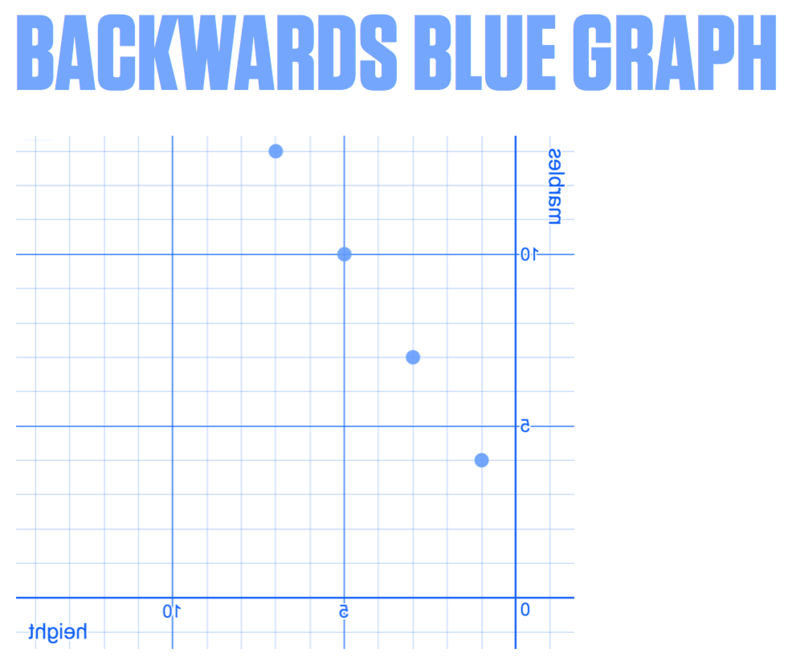 I propose we add a representation to the holy trinity of graphs, equations, and tables: “backwards blue graphs.” Have a look. Expert mathematicians and math teachers instantly see the uselessness of the backwards blue graph representation. 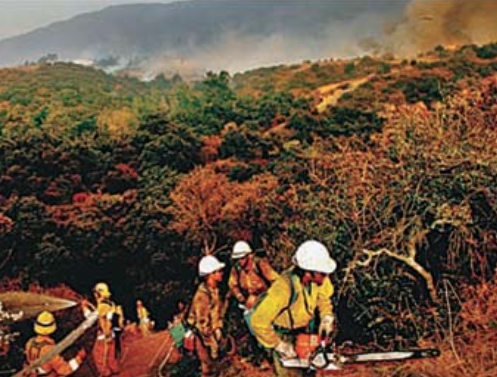 It offers us no extra insight into or power over the data. But my suspicion is that many students feel that way about all the representations. They’re all the backwards blue graphs. Students will dutifully and even capably create tables, equations, and graphs but do they understand the advantages that each one affords us? Or do they just understand that their grades depend on capably creating each representation? 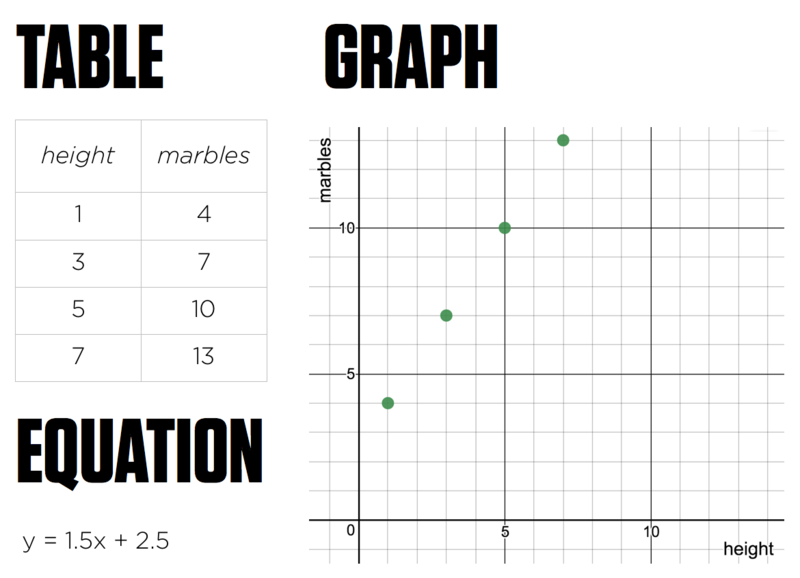 At Desmos, we created Playing Catch-Up to put students in a place to experience the power of equations over other representations. Namely, equations offer us precision. So we show students a scenario in which Julio Jones get a head start over Rich Eisen, but runs at half speed. 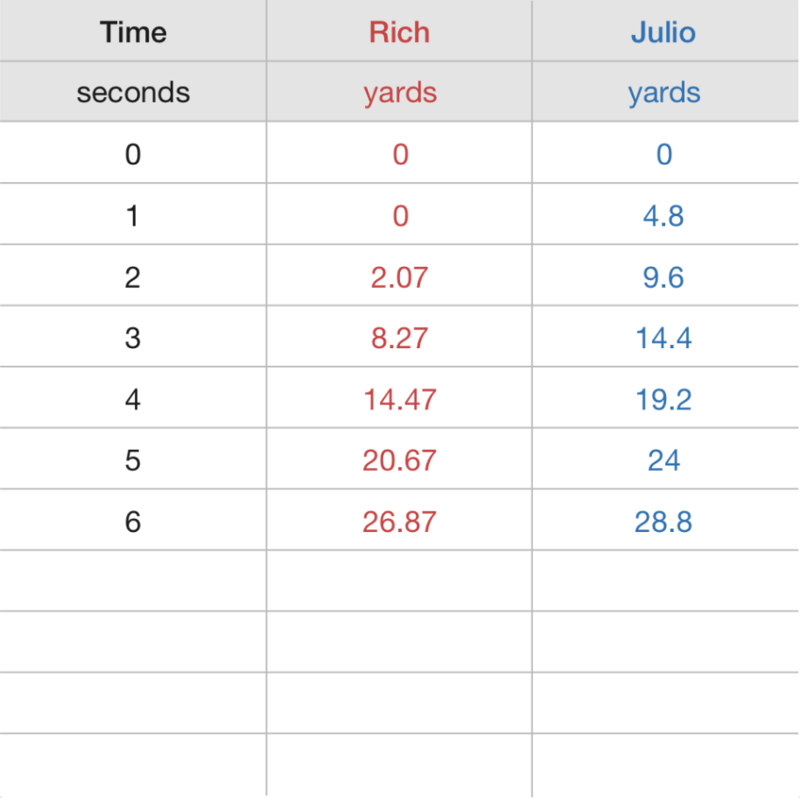 We ask students to extend a graph to determine when Rich will catch Julio. We ask students to extend a table to answer the same question. Finally we offer them these equations. Our intent with this three-screen instructional sequence is to put teachers in a place to have a conversation with students about one advantage equations have over the other representations. 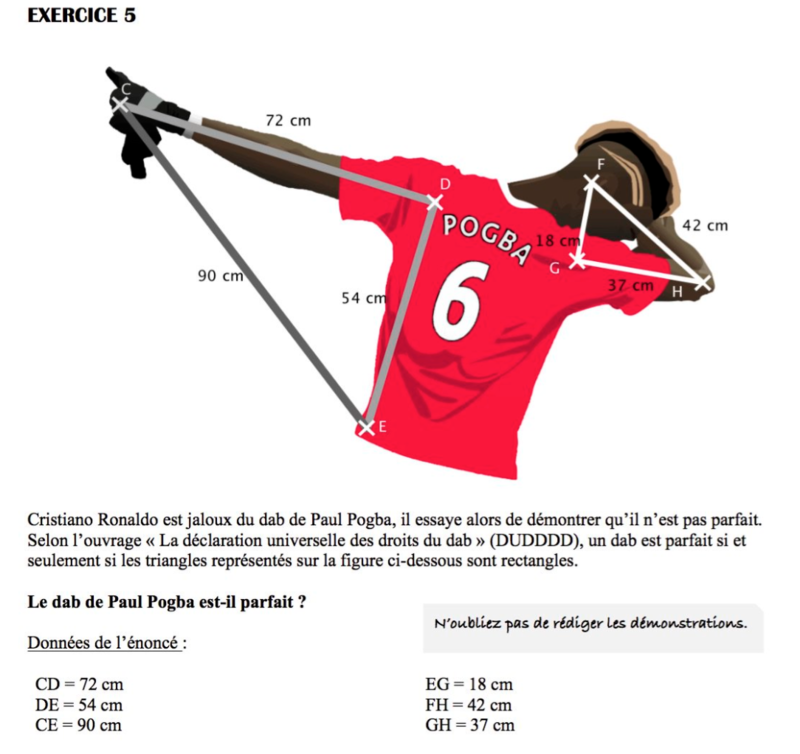 They offer us more precision and confidence in our answer. Without that conversation, graphs, tables, and equations all may as well be the backwards blue graphs. The power of equations is precision. We put students in a place to experience that power by asking them to make predictions using the imprecise representations first. In what ways are graphs uniquely powerful? Tables? How will you put students in a place to experience those powers? Students should be able to approach a problem from several points of view and be encouraged to switch among representations until they are able to understand the situation and proceed along a path that will lead them to a solution. This implies that students view representations as tools that they can use to help them solve problems, rather than as an end in themselves. I think an analogy here are the 3 ‘representations’ of location/directions provided by Google: a map, written directions, and street view. They all provide similar or at least related information but each offers advantages depending on the purpose and background knowledge of the user. I’ve noticed that kids who get the click that they all are connected understand stuff down the road a lot better, so I build in explicit teaching around seeing those connections (where is the y-intercept in the table? how can I see the slope in the equation?). It would be neat if kids could color code and write on things in this exercise, but computers are not good at letting you add stuff like that.